Asterisk Password allows you to view passwords hidden behind asterisks in password fields (including Multilingual and Unicode ones). 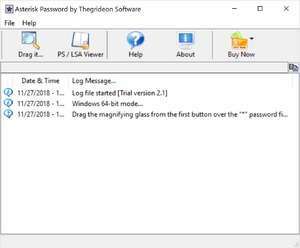 Asterisk Password uncovers hidden passwords in password dialog boxes, web pages and ActiveX controls. Another great feature of this software download is the ability to display Protected Storage content. For security reasons, you should also check out the Asterisk Password Recovery download at LO4D.com which includes virus and malware tests. Additional screenshots of this application download may be available, too. 4.75 out of 5 based on 4 ratings. Asterisk Password Recovery has a presence on social networks.